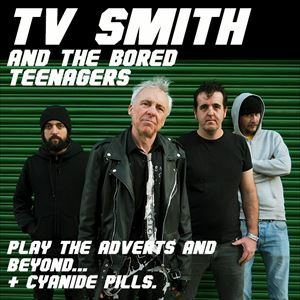 TV Smith was founder member, singer and songwriter for the Adverts, who formed in late 1976, and became one of the leading bands in the first wave of British punk rock. In early 1977, they performed regularly at the newly-opened Roxy Club in London, and gained cult success with the Stiff Records single "One Chord Wonders." Their next release, "Gary Gilmore's Eyes" became a hit record, leading to many radio and TV appearances and extensive media interest. A further single, “No Time To Be 21,” also entered the charts, and the band spent the rest of the year playing live, including major tours with The Damned and Iggy Pop. The album that followed in early 1978, "Crossing the Red Sea with the Adverts," is still considered a genuine classic of the era and is often cited as one of the twenty best punk albums ever released. At the request of his fans, in 2013 TV released “The Acoustic Sessions,” an album of solo performances, recorded live in the studio with renowned producer Jon Caffery. Vive Le Rock magazine called it “an album that sits alongside the Angry Brigade output of Pete Townsend, Roger Waters and Lou Reed, but hits you with the wallop of bare knuckle punk.” Late 2014 saw the release of a new TV Smith album entitled “I Delete," his sixteenth as a solo artist, which has been acclaimed by critics and fans alike. Fiercely independent and determinedly embodying the original spirit of punk rock, TV continues to tour the world, bringing his epic solo show to ever-increasing audiences. Remarkably, he plays his concerts without a setlist and every performance contains a different selection of songs chosen on the night. He plays more than 120 gigs a year and has performed all over Europe, as well as the USA, Japan, Australia, South America, Russia – and even Heligoland. Not content with playing live, TV has also has written about his on-the-road experiences in five books of highly popular Tour Diaries, described by “Sandman” and “American Gods” author Neil Gaiman as, “hilarious, honest and incredibly true.” The fifth and final volume, “Book Of The Year,” contains a write-up of every one of the 130 gigs TV played in 2013. In Autumn of 2016, TV’s first ever book of lyrics will be published by Foruli Codex. Exquisitely designed by Cure designer Andy Vella, and entitled “The Alternative Top 50,” the book comprises fifty of what are arguably TV’s best lyrics. It will be available as a conventional paperback, as well as an exclusive collectors’ hardback edition which includes a 10’ vinyl single that TV has recorded with Henry Rollins.